How can I view the Paperless OCR results? When Optical Character Recognition (OCR) is performed on a document in a Paperless library either by import or the "Recognize Text" command, the plain text OCR output is written to a special field: OCR Text. The OCR Text field is included by default in the Fields list under Library Configuration > Data Types, but it is not shown by default by any document type. Drag OCR text field from the Fields column to the display column. 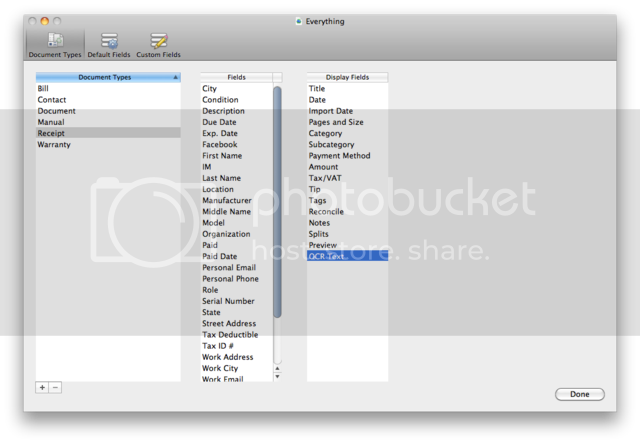 Hint: Display fields are shown from top to bottom, drag and drop fields to re-order them in the list. The results will appear in view once you click done. Note: Text recognized is not written to the PDF file itself, but exists in the Paperless database and can be modified, corrected and used in searches. How can the text-retrieval (OCR) process in Paperless typically be expected to work?